Research is the heartbeat of science. Finding answers usually opens doors to new questions that need more answers. The Department of Biological Sciences is committed to providing opportunities for students to learn more about the nature and practice of research by working closely with a faculty mentor. 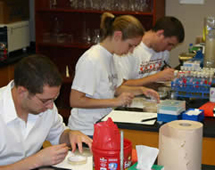 Faculty members from all areas of biology in the department have active research programs that regularly include undergraduate participants. As a student, the best way to get involved is to get to know the faculty, learn their interests, and find out more about their research programs. Depending on the project, students may be involved in experimental design, as well as data collection and analysis. Research students also gain valuable experience by presenting their findings at state, regional and national scholarly meetings. Below are only a few of the projects that UTM faculty and students are exploring together. Tomorrow's discoveries may only be an experiment away. If you are interested in understanding more about how organisms function at the molecular level, UTM's Department of Biological Sciences has opportunities for you. Faculty interests include such projects learning how important compounds like porphyrin are produced by photosynthetic bacteria and how pathogenic microorganisms use iron. 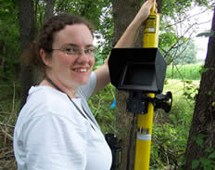 For example, faculty members are active in monitoring reclaimed mine areas, studying the habitat use of native and introduced bird species, examining the microbial diversity of Reelfoot Lake using modern molecular methods, and experimentally exploring the role that sensory systems (vision, olfaction, tact) play in the ecological interactions that animals establish in their environment. Organismal Biology faculty have more opportunities for student involvement with projects that explore topics as diverse as how age affects facial recognition patterns in humans, characterizing the gut bacteria that may help sapsuckers survive during the winter, and how inexperienced pollinators use sensory information (colors, smells, textures) to find a flower for the first time, as well as how learning and memory help them to be more efficient nectar foragers.